Bigeye are found in the subtropical and tropical areas of the Atlantic, with the exception of the Mediterranean, as well as in the Indian and Pacific Oceans. Bigeye tuna are excellent swimmers. Unlike many other fish, they cannot pump water over their gills, but instead, swim with their mouths open, which forces water over their gills. While this is an efficient way of getting water over their gills, it also means that if they stop swimming, they will suffocate. Juvenile and small adult bigeye tuna school at the ocean’s surface, sometimes together with yellowfin or skipjack tuna. Mature bigeye tuna spawn at least twice a year, releasing between an incredible 2.9 million and 6.3 million eggs each time. Big eye tuna can live as long as 10 to 12 years. Their diet includes squid, crustaceans, mullet, sardines, small mackerel and some deep water species. It is estimated that less than 20 percent of the population remains. Bigeye tuna can dive deeper than other tuna species and exhibit extensive vertical movements. Bigeye tuna are prized in Asia for sashimi, as well as frozen and fresh in other markets. 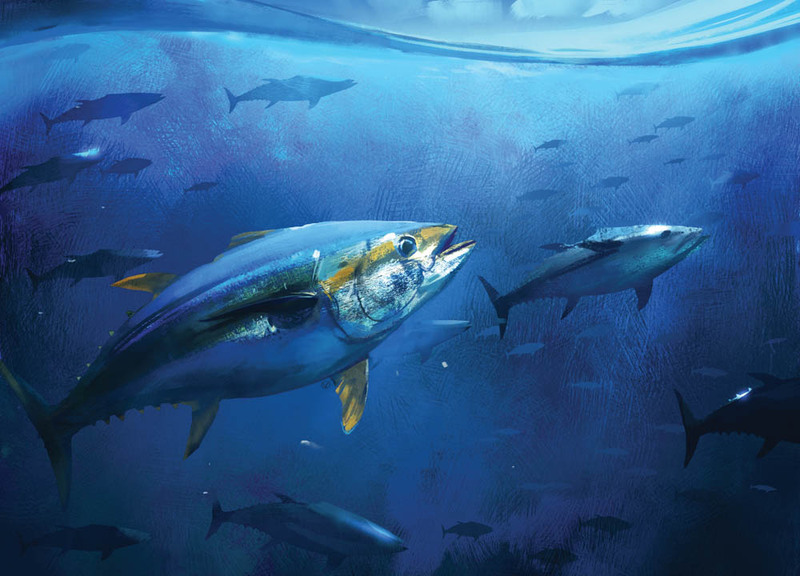 As bluefin tuna populations shrink around the world, pressure on bigeye fisheries increases.